Embrava Premium Sports Bottle is specially designed with you, the active user in mind. Open the bottle with just one-click, slide your hand into the side strap and start drinking! 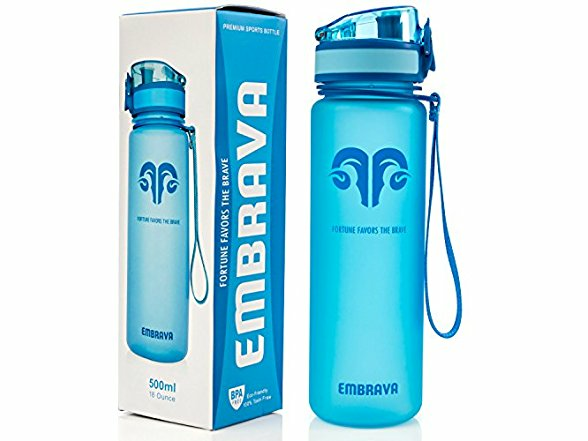 The Embrava bottle is perfect for Running, Gym, Yoga, Crossfit, Tennis, MMA, Travel, Hiking or Office Use! BPA FREE TRITAN PLASTIC - Our bottles are made from 100% Toxin Free US imported Tritan Co-polyester plastic that is SAFE to your body and environmentally friendly. No more worrying about harmful chemicals such as BPA affecting your health, which are present in many water bottles. If you are looking for a bottle that is durable and safe, Embrava is the right choice! PREMIUM QUALITY SINGLE WALL DESIGN - Unlike dull, off the shelf water bottles, we designed the Embrava bottle to look and function better than any other water bottle! It is ergonomically shaped to make one-handed use a breeze, with a tough carry-strap and a special reflective frosted casing that reacts uniquely to your environment. It is both stylish and convenient to use, and each bottle comes in a FREE Gift Box for a great present! 18 OZ SMALL AND LIGHTWEIGHT - This is where our premium design shines! 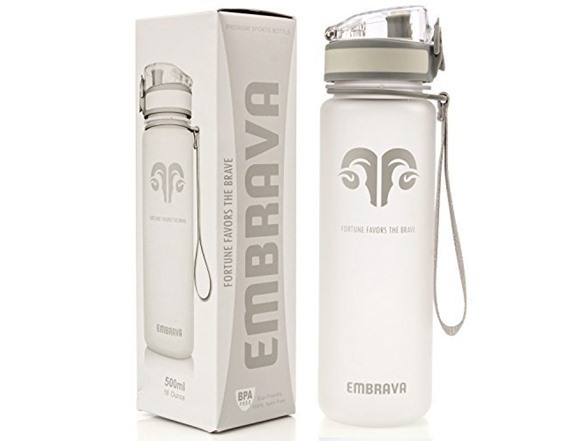 Embrava 18 ounce, 500 ml bottles are durable, yet light to carry around! The special spill-proof top swings open with a one-handed push of a button! An air hole placed on the lid ensures fast flow of water with effortless drinking. When you're done with our workout, lock the bottle to make it 100% leak-proof and dirt-proof.